It is hard enough to care for the severely injured one at a time even when you have everything and everyone you need on hand. When the numbers and severity of the injured overwhelm and exhaust the systems, resources, and staff to care for them, how do you make sure you are indeed providing the “most benefit” to the “greatest number”? These are some of the greatest challenges the trauma community faces around the world. In 2017, Trauma Tasmania looked at an Australian benchmark for inclusive regionalised trauma care, a model of a modern mature trauma system. 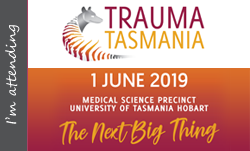 In 2018, Trauma Tasmania examined some of the most problematic injuries trauma clinicians care for.